Available in boxes of 35 each. restriction of downward vision as duckbill or cone masks do. Positive Facial Lock® (PFL) — Allows total facial closure for "custom fit"
on any size face when donned correctly. no natural rubber latex, eliminating latex allergy concerns. 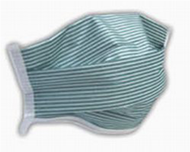 when stored, as duckbill and cone respirators can, and is easy to carry with you.